performed with the Encore system. Note: Inflated cuff on ET Tube still in place. Single patient use inclusive procedure kit with 3 adjustable Encore Bone Screws to perform Hyoid Suspension, Tongue Suspension or both. 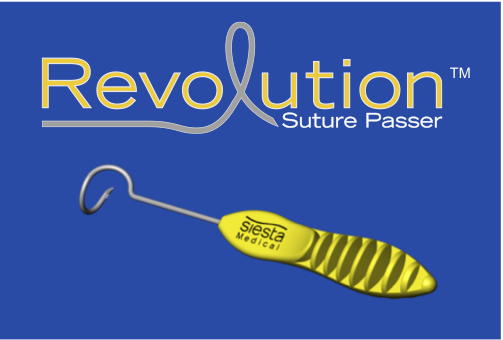 The Encore system from Siesta Medical is a minimally invasive surgical procedure kit designed to provide airway stabilization via anterior suspension of the Hyoid and Tongue Base with adjustable sutures. Both procedures are FDA cleared for individual use or when performed in conjunction. These techniques are often combined with other airway surgical procedures to address multiple points of obstruction that are contributing factors in the majority of patients suffering with Obstructive Sleep Apnea. Actual Procedure footage of the Revolution presented in Dr Van Tassel's procedure to the left. Please contact customer service at 866-720-8080 or via eMail with any questions or to arrange Clinical Support.